An Arianespace Soyuz 2 rocket launches six new mobile communications satellites to boost a network for the service provider Globalstar. BAIKONURCOSMODROME, Kazakhstan ? Six Globalstar second-generation mobilecommunicationssatellites were successfully placed into orbit Wednesday (Oct. 20)aboard afour-stage Soyuz rocket, a launch that Globalstar hopes will graduallyreturnits business to full operational status after more than three years ofserviceand revenue declines. Globalstarofficials confirmed that the 700-kilogram satelliteswere healthy in their planned parking orbit after the launchand had sentsignals to a ground station in South Korea. Followinga demand of its insurance underwriters, the Milpitas, Calif.-basedcompany willspend the next four or five months testing the satellites to be surethe newdesign functions according to specification. Oneof the newly launched satellites will be integrated into Globalstar'sexisting constellation by early December, with two more to beplaced intooperation by January. The three others will enter service by February. Globalstarhas ordered 24 satellites ? plus the equivalent of six spares? frommanufacturer Thales Alenia Space of France and Italy, with keyfinancing backedby France's Coface export-credit agency. The second launch of sixsatellites isscheduled for February or March, with the two remaining launches ? allaboardRussian-built Soyuz rockets operated out of Baikonur ? scheduled tooccur byJune. AnthonyJ. Navarra, president of global operations for Globalstar, said newsatellites,beginning with those launched Oct. 20, will be inserted into positionsat whichthey can have the most impact in terms of returning two-way telephoneserviceto Globalstar customers. Followingdegradation of Globalstar's original 48-satellite constellation that beganin early 2007 and has been blamed on radiation levels,Globalstar'stelephone and two-way data service has been in a downward spiral. Thecompanyhas redoubled its efforts to provide what it calls "simplex" orone-way data messaging. It has also provided customers with an Internetprogramto guide users as to when a call from a Globalstar phone is most likelyto beprocessed. "Thefact is that right now we have only eight satellites that provide fullfunctionality in terms of the two-way service," Navarra said in aninterview today (Oct. 19). "So you get a fairly substantial increase inservice with every couple of satellites you add. But the fact is thatit is thesummer of 2011 when you should see full service restoration." Globalstarhas an option to order 24 additional satellites from Thales Alenia, ata fixedprice of about $15 million per satellite, that expires in June 2012.Navarrasaid the company has every intention of exercising the option, althoughhenoted that the only real difference between a constellation of 32satellitesand one of 48 satellites is network capacity, not network quality. Underthe terms of its bank- and Coface-backed financing, Globalstar mustmeetrevenue targets before getting access to the remaining loans availableto it. Mostof Globalstar's current satellites were launched in 1999 and 2000 within-orbitservice lives estimated at seven years. Buteight first-generation spacecraft were not launched before 2007. It isthesesatellites, plus the 24 to be launched by mid-2011, that Globalstarrefers toas its 32-satellite constellation. Navarra said the company believesthe eightrecently launched first-generation satellites have between four andfive yearsof full service ahead of them before they, too, fall victim to theradiation-caused degradation that has crippled the constellation. Thesecond-generation satellites have reinforced radiation protection, morebackupfunctions and an estimated 15-year service life ? double that of thefirst generation. Thecommercial Soyuz rocket is operated by Starsem, a French-Russian jointventurein which Europe's Arianespace launch consortium is a shareholder. Evry,France-based Arianespace expects to begin operating Soyuz on its own,fromEurope's Guiana Space Center spaceport in French Guiana, in April 2011. 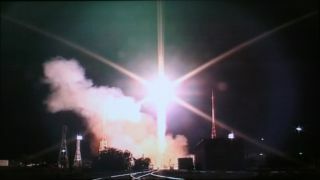 ButStarsem-organized Soyuz launches from the Baikonur Cosmodrome willcontinue atleast until 2012, according to Starsem and Arianespace officials.